Left to right: Pat Guest, Ability NB Board member, & Lydia LaPointe. Lydia Lapointe – Our Volunteer Award of Excellence is presented annually to an individual or group who demonstrates outstanding initiative and leadership in their volunteer work with Ability NB. The recipient of our 2014-2015 Volunteer Award of Excellence is Lydia LaPointe. Ability NB had the pleasure of first meeting Lydia in 2008 when she walked through our door as a representative with York Financial Services. Since then, Ability NB has found a dedicated advocate, volunteer, and committee member who also manages a very hectic professional schedule. Lydia is a passionate individual who has a unique ability to find a way to connect with everyone she meets. She has been an enthusiastic member of our annual auction committee and has volunteered 100 hours of service with our organization including driving hundreds of kilometres to pick up donations of art and other items for the event. Each year since 2012, Lydia can also be found in Officer’s Square in September volunteering at Feast in the Field! We’re proud to have Lydia as a volunteer for our organization and are thankful for her positive energy, ideas and dedication to Ability NB. 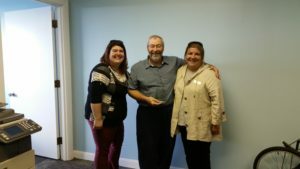 Left to right: Tammy Wright, Ability NB Seniors Rehabilitation Counsellor; Lockie Young and Haley Flaro, Ability NB Executive Director. 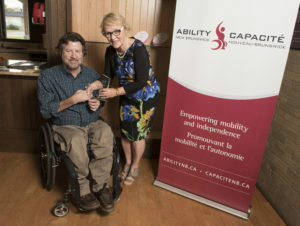 Lockie Young – Our Ambassador of the Year Award is presented annually to a person affiliated with our organization who has been a strong ambassador for our organization, persons with a mobility disability or disability issues. The recipient of our 2014-2015 Ambassador of the Year Award is Lockie Young of Lower Coverdale, NB. Lockie Young is a genuine man who is always paying-it-forward within his local community; his lower leg amputation has certainly not slowed him down! Whether it be volunteering with the NB Lung Association to raise awareness of the risks of smoking, raising funds for the local Food Depot Alimentaire by creating a recipe book, or being the first to answer our calls and donate during our Ability NB crowd sourcing initiatives – his generosity is felt by many in the greater Moncton community. Lockie utilizes his ability to connect with others by following his passion of writing and can also be found occasionally reading his new novels to seniors in special cares home who have been known stay up way past their regular bed time to hear the end of his exciting story. Furthermore, Lockie’s willingness to help others and share his story has resulted in a very successful peer matches with other Ability NB seniors who have experienced leg amputations and who needed a positive role model. Once these connections were built, it took no time for Lockie to take them under his wing and provide them with regular follow-up to see how they are doing and continue motivating them with their transition. Ultimately, it is Lockie’s positivity and ability to empower others that make it so that he is an incredible ambassador. 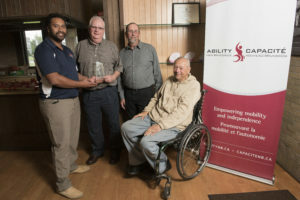 Left to right: Dunu Eliaba, Manager of Para NB – Sport & Recreation; Wayne Cooper and Dale Parkhill from the Thistle St. Andrew’s Curling Club, & Wilf Torunski, Ability NB Board member. Thistle St. Andrew’s Curling Club – Our Para Sport & Recreation Award is presented annually to an individual, group or organization that has made a significant contribution to parallel sport and recreation in New Brunswick in areas such as competition and achievement, program development, officiating or coaching. The recipient of our 2014-2015 award is the Thistle St. Andrew’s Curling Club. After a fire damaged the club in May 2011, leaders at Thistle St. Andrew’s saw an opportunity to make design changes to their club to ensure access for everyone to their lounge and ice surfaces and they reached out to Ability NB to take a site tour and offer recommendations. They also saw it as an opportunity to build a wheelchair curling program. At that time, there were only two wheelchair accessible curling rinks in NB and a significant lack of opportunity for wheelchair curling. Following the renovations, the club held wheelchair curling clinics and first contact events – opportunities for New Brunswickers with a mobility disability to try wheelchair curling and get involved. Jane Arseneau, Wayne Cooper, Dale Parkhill and others worked tirelessly to get wheelchair curling going at the club and nurtured New Brunswick’s first ever wheelchair curling team to attend the Canadian Wheelchair Curling Championships. Their dedication has led to the establishment of this wheelchair curling team and three strong showings at the national level as Team NB. Ability NB applauds Thistle St. Andrew’s and its volunteers for their dedication to parallel sport and recreation!